This is fully automatic horizontal / Vertical coil type 3-pass wet back oil/gas fired, forced draft system. It incorporates an integral combustion chamber arranged as a nest of concentric helical tube coil fabricated out of seamless/high heat resistant ERW boiler tubes recommended for high temperature application. The concentric coils are placed within a shell fabricated out of Mild Steel. The wet back jacket and concentric coil allows three flues passes to ensure low heat release and maximum heat transfer. The design warrants little amount of refractory work on the hinged door to keep thermal inertia low. The 3-pass wet back design ensures maximum absorption of heat and flue gas temperature at less than 300°C in a standard heater. The heater is equipped with a fully ultimate pressure atomizing type 2-stage, 3-stage or modulating oil/gas burner. The Burner is a mono-block construction and can be hinged to left or right. It simplifies the work of combustions head diffuser, nozzles and ignition electrodes. 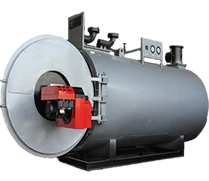 Preheated version burners are used for heavy oil firing which are equipped with electric or media oil pre-heaters which are heated nozzle heads and oil line systems. This ensures availability of evenly heated oil for flame establishment. The nozzle recirculation and positive shut off at the nozzle tip ensures trouble free operation even if temperature drops to below 0°C. Unit offering 92 ± 2% efficiency is incorporated with preheated version of burners developed for special industrial and commercial application in certain industrial processes (i.e. thermic fluid heating). Very high rate of flue gas temperature occurs due to the high heat transfer media temperature. Tremendous amount of energy can be retrieved by installing heat exchanger (air pre-heater) in the flue gas path which otherwise is lost through stack. efficiency increase up to 3 to 5%. High efficiency 87 ± 2% on NCV of fuel on LGF model. 300° C temperature near about atmospheric pressure. No corrosion or scale formation. It's a fully automatic operation. Adjustable temperature at heater outlet up 300°C with ± 1% accuracy. Exempt from Indian Boiler regulation Act. Thermic fluid can be used till years. LGF for standard application is available in oil and Gas fired models with output ranging from 50,000 Kcals/hr to 5,000,000 Kcals/hr. Custom-built units are designed and manufactured to suit special process needs. Non Standard LGF is available in capacity ranging from 200,000 to 5,000,000 Kcals/hr. Differential temperature range 5°C to 40°C.